Leading up to the start of Denver Nuggets training camp, T.J. McBride will be doing breakdowns of each and every player on the Nuggets roster to show what makes them good, where they have improved, and what they need to improve upon in the season to come. Check back every Tuesday, Thursday, and Saturday for the next player breakdown. 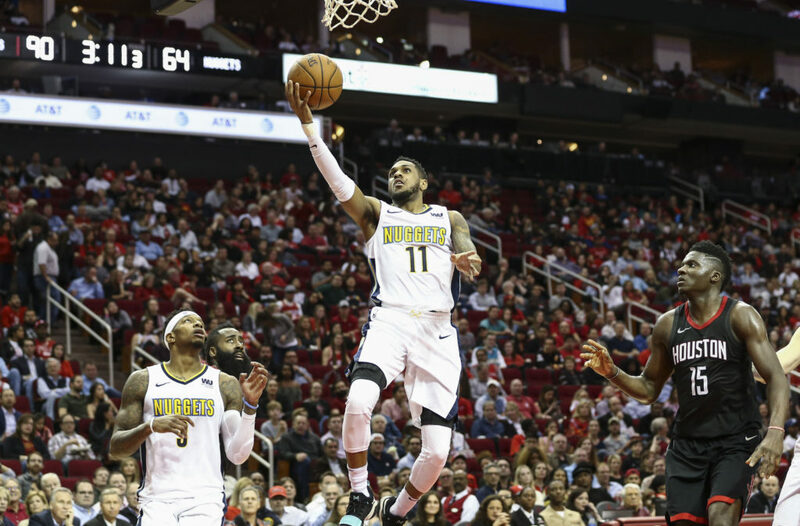 Monte Morris, armed with a new three-year NBA contract, is coming into his sophomore campaign with a larger role, but still lot of room to improve. Morris has always been a strong facilitator, but he has grown into much more than just a phenomenal assist-to-turnover machine. Now, Morris’ three-level scoring is beginning to take shape and his ability to create his own offense is just beginning to rise to the surface. Morris will undoubtably be the Nuggets third point guard next year, behind Jamal Murray and Isaiah Thomas, but he has a shot to earn a role off of the bench playing at either guard position. With that being said, let’s dive into what makes Morris such a tantalizing prospect for Denver and how he can improve. The one thing that Morris has always done well is be a floor general style of a point guard. He is smooth and methodical when directing his offensive unit and almost always makes the right decision with the ball in his hands. That ability shows in his statistics. When including over 193 total games between four years at Iowa State, Summer League, G-League, and the NBA (including preseason), Morris has accumulated an absurd 1066 assists and just 248 turnovers. That equates to an assist-to-turnover ratio of 4.29-to-1 which is just downright impressive no matter which way you slice it. When watching Morris play as the initiator of an offense, it is easy to see how effortless his facilitating comes to him. Look at the video below as Morris is able to manipulate the defense with nothing but his impressive basketball IQ and his understanding of passing angles. Based on the way that the Toronto Raptors were defending him during their two match-ups in summer league, Morris knew that the big who is defending Thomas Welsh — the Nuggets 58th pick in the 2018 NBA Draft and two-way contract player — was going to switch onto him to keep him from getting to the rim and scrambling the defense. Instead of doing what the defense expects, Morris draws two defenders away from Welsh as he receives the pass leaving Welsh wide open. From there, it is an easy bounce pass to get Welsh the open look at a jump shot from the elbow. That pass is all instincts and basketball IQ. Morris doesn’t just knows where every single one of his teammates will be on the floor at any given time, but he also knows how the positioning of him and his teammates will force opposing defenses to shift. Look below how Morris perfectly navigates a dribble-handoff set that evolves into a pick and roll with Kennedy Meeks before finding Nuggets newly signed two-way contract player DeVaughn Akoon-Purcell for the open three-pointer. In the video above, Morris knows that he is the focal point for the Milwaukee Bucks defense. Because of that, he is able to force help from the weak side — particularly the defender on Akoon-Purcell. Once the help comes, Morris drops a pass right onto the shooting hand of Akoon-Purcell who nails the triple. Morris has the feel, instincts, and basketball intelligence to be a solid offensive initiator at the NBA level. It is hard to find a better floor general to be a third point guard than Morris. While his facilitating is strong, he is still improving as a scorer. Morris is a strong facilitating point guard, but he is still rounding out the rest of his offensive game. While he is a strong finisher and has good touch in the mid-range, Morris is still learning how to be a consistent scoring threat from all three levels. He has improved as a finisher thanks to adding strength, which is a big step for him, but he is still fighting to improve his ability to knock down three-point jump shots. He has always been a crafty and efficient finisher at the rim, but since he was drafted, Morris has improved in that area. A big reason why is his improved strength as Morris shows in the clip below. Look above at how Monte is able to stay strong dribbling down the baseline. He does not get pushed off of his path and is able to create a scoring lane on the opposite side of the rim. Once he gets to his spot, he uses the rim to shield himself from the shot blocker and gets the layup to drop while getting fouled. Morris is not just able to get to the rim either. His touch in the mid-range helps him mitigate his physical deficiencies. He uses a mix of floaters, runners, and pull-up jumpers to keep the defense honest and off-balance when defending him. Look at how Morris is able to avoid the shot blocker after getting into the paint courtesy of a great drag screen by Welsh. Morris knows that the help defense will be coming from somewhere, so instead of waiting for it to arrive Morris preemptively uses a floater to eradicate any chance of a defender getting to him in time. Morris being able to get to score efficiently in the paint without getting to the rim will open up the floor for him, but nothing stretches defenses quite like being able to hit three-point jumpers. The last offensive addition to Morris’ game will be his three-point shooting. He was a strong shooter in college with a career three-point shooting percentage of 38.1 percent on 399 total attempts, but he has struggled extending his shot out to the NBA three-point line, which is a bit further away than the colligate three-point line. In the G-League, Morris shot just 33.1 percent from three-point distance on 4.8 attempts per game. In two years at summer league — over 10 games — Morris has shot just 27.3 percent on 22 total attempts. Hopefully, that trend is changing. Over the summer, sources have told Mile High Sports that Morris has reconfigured his jump shot and is shooting much better from distance because of it. Going back to July, Morris shot 35.7 percent from three-point distance in summer league and he has shot it much better in practice. If Morris can become average or slightly above average when shooting from distance, he will have an exponentially more space to work with on the floor which will make his skill set shine even brighter. The one untapped portion of Morris’ game is his ability to create his own jump shot when the offense stagnates and his team needs a bucket. Morris was able to harness this skill in college at Iowa State, but in the NBA things are a bit different. The size, length, and strength of NBA athletes is much different than the competition in college. Now, Morris is having to redesign how he creates separation to get his own shot and so far his favorite move seems to be the step back when he is going to his left. Morris has not perfected his step-back jumper yet, but it is clear that it is a part of his offensive arsenal. If this ability continues to grow, it could be a strong weapon for him to unleash. Look below where he uses the same step-back going to his left once again. This time, he creates tons of separation and sends his defender flying away from him. Morris, who is still just 23-years-old, still has lots of untapped potential left within his game. While he may not project to be a high-level starting point guard, he has already shown that he has the skill set to be a very helpful backup point guard for years to come.